There's been a discussion on the Baren Forum recently about money, selling work, what people buy and whether or not it's possible to earn a living as an artist...especially in These Economic Times. All the while I've been putting together a self-sponsored show for the gallery at my local library (see previous post) and watching the costs mount. At this point, including all the framing and publicity but not yet including snacks and drinks for the opening, I've spent $670. That's a lot of money. Especially in These Economic Times. Obviously I hope to sell a few prints and break even, but breaking even is certainly not a given. So lest I be disappointed about losing money on the thing, I've been thinking of this event also as a sort of party I'm hosting, where I've invited a bunch of friends, and hopefully their friends too, to come by and enjoy printmaking with me. Also on the topic of These Economic Times, the other day I heard a funny little essay on NPR about art in hard times by poet Andrei Codrescu, who says that one of the best conditions for the production of good art is when "there's a general depression and a whole lot of free time." You can read it or listen to it by clicking here. For the past week I've been hard at work matting and framing, doing promo, and making signage for a show here in Northampton at The Hosmer Gallery in our local library. What a lot of work it is to mount a show! This is my first time doing it, and I'm humbled. The gallery is quite large and each month two artists share the space. I'll have about 25 pieces on display. Rather than dealing with frames, I used Swiss Corner Clips to frame most of the pieces -- just glass, mat and backing. The larger pieces (Three Prophets, etc.) I'll be hanging without glass in a sort of scroll-like way. I'll show you that once I figure out how it will work. I'm looking forward to the opportunity to show my friends and family why they never see me around town! This past Sunday was the opening day of the 2009 Boston Printmakers North American Biennial. Lynn & I decided to spend the whole weekend in the city and we had a great time. We especially enjoyed seeing the Shepard Fairey exhibit at the ICA (Institute of Contemporary Art). The Biennial opening day Sunday was full of events -- a brunch, a lecture by juror Roberta Waddell, a preview of the show for artists and patrons, and then a public opening. All told, I spent 6 hours on site. My favorite part of the day was having the opportunity to meet Roberta Waddell, Curator Emerita of the NY Public Library print collection. Roberta is a lovely person as well as exceptionally knowledgeable about prints, and her focus on the artists and the art in the show was appreciated by all. In her talk she showed slides of all 124 images she had chosen and she managed to speak a few sentences about every piece and every artist. It was clear she had done a tremendous amount of research, visiting artists' web sites and collecting information about each piece. The Boston Printmakers members and board had a similar attitude. They were very welcoming of the artists, very present and solicitous of peoples' needs. I felt really taken care of. Out of the 124 selected prints, about 30 were relief prints, either woodcuts or linocuts. Many of the woodcut artists who were represented at the show were artists I'm familiar with -- Karen Kunc, Katie Badwin, Mary Brodbeck (moku hanga), and Kristina Hagman who I enjoyed meeting at the show. I also got to see the work of Baren Forum member James Mundie up close and personal. James often creates work about "oddities" and his accepted print was a very fine and detailed carving of the skulls of conjoined twins. I know from the Forum that James often carves with a plain old fashioned razor blade, so I really appreciated the opportunity to see the print up close. I also got acquainted with some artists I hadn't heard of before. A piece I really liked was a large self-portrait woodcut by California artist Nathan Catlin showing the artist with a black eye. Neil Shigley creates very large, expressive, luminous relief prints of homeless people by carving plexiglass and mounting the prints onto canvas. And Wendy Willis' linocut swimmers were a joyful sight. My print Borders #1 - U.S./Mexico will be on display beginning this Sunday at the 2009 Boston Printmakers Biennial. If you're in the Boston area, I hope you'll stop by for the opening reception from 3-5 pm at 808 Gallery, 808 Commonwealth Ave at Boston University. I'd love to meet you! The portrait of Lincoln I've been wrestling with has taken a turn. Let me show you what happened. Yesterday morning I pulled out some better proofing paper and worked on my pigments to get the red and blue colors to match the sample swatch that Julia Talcott sent me. (Julia is the Boston illustrator who organized this (Un)Limited print exchange.) Then I took a few proofs of the two blocks with the adjusted colors. Right away I felt that the overprinting of the blue and red was too muddy, and that the transparent pigments I use for moku hanga would be really hard to adjust for a pleasing result. I also felt that something was lacking, but I wasn't sure what. So I hung the proof up on my wall to contemplate what to do next. That's when Rob Dunlavey, another illustrator who's participating in (Un)Limited, commented on my proof on my Flickr site. He asked me a simple question that hit the spot for me. He wrote, "will it speak to your other work?" That question helped me see what was missing: I had simply portrayed Lincoln with no comment. I never do that. I always say something about my subject, either by juxtaposing different time periods or locations or adding words - something that makes a comparison or a statement or at least a little joke about the image I'm presenting. So WHAT ABOUT Lincoln? What did I want to say about him? I wanted to say something about his character, about why he still seems so relevant today, about why we love Lincoln so much. That's when I knew it was time to go back to a little illustrator trick I've used for many years. I call it working the cliché. There's a cliché for every topic (Examples: Cash Problems - a guy pulling his pocket inside out and it's empty; Stock Market - riding a roller coaster; Retirement - rocking chair; Active Retirement - golf course) so when you work the cliché that's where you start. The way I do it is I imagine asking my mother what I should draw. "Mom, the topic is Lincoln and I have to use red white and blue." "Oh," I hear her saying, "the flag. Why don't you put a flag in the background." This is where it gets difficult, because my immediate reaction to the flag in the background idea is "ewww." But you've got to go with the cliché. So OK. Stars. Stripes. Red stripes. I draw a few red stripes on one of the proofs. "Yuck," I think. And then POW, it happens. Stripes. The I Ching. An I Ching hexagram for Lincoln! I look up the I Ching. Number 8 is definitely Lincoln. The number 8 keyword is "Union." It's about banding together, holding together. The I Ching says, Such holding together calls for a central figure around whom other persons may unite. To become a center of influence holding people together is a grave matter and fraught with great responsibility. It requires greatness of spirit, consistency, and strength. This was Lincoln, and this is also, I think, the kind of leader that Barack Obama is aspiring to be. I carved away the background in my Lincoln blocks, printed the portrait in two tones of blue, and then added the I Ching hexagram in red. The ink colors and intensities still need to be adjusted, but this is the general idea. I'll print the edition next week after my Rives paper arrives. This morning I pulled out my favorite section of the Sunday NY Times, the Book Review, to look at the illustrations (confession: I hardly ever actually read the reviews) and I was amazed to see that the art director had commissioned 7 illustrators to do portraits of Lincoln in two colors -- red and blue! Damn, just like the piece I'm doing this week for the Limited/Unlimited print exchange. I feel like I'm always just a few steps behind the pop culture freight train. I still need to adjust the ink colors to better match the oil-based inks the others will be using, but I love how the image seems like it would pop if you wore 3-D glasses. I'm also really excited to do an image that only takes two impressions! And here's a link to the NY Times portraits. Enjoy! Cullom Gallery in Seattle is showing the work of Berlin-based artist Eva Pietzcker, a woodblock artist whose work I have admired since I discovered it several years ago through the Baren Forum. 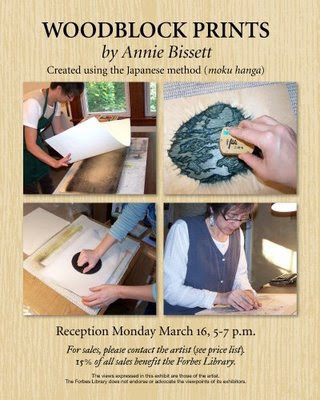 Eighteen of Eva's large, bold moku hanga landscape prints will be on display at Cullom through March. If you aren't near Seattle, you can see all the prints on the Cullom Gallery web site. Also in Seattle this weekend at Davidson and Cullom Galleries is the Seattle Print Fair. I wish I lived closer to the Pacific northwest! I won't lie to you - one of the things I'm trying to accomplish with these Pilgrim prints is to economize my blocks by using them more than once. In this print, I plan to take the little clump of Pilgrims from my last print and put them in a new setting to represent where they ended up at the other end of their Mayflower boat ride. Being thus passed the vast ocean, and a sea of troubles before in their preparation, they had now no friends to welcome them nor inns to entertain or refresh their weatherbeaten bodies; no houses or much less town to repair to, to seek for succour... And for the season it was winter. Later, Bradford describes the group that sets out to explore the first Cape Cod landing site and he says that they "fell into such thickets as were ready to tear their clothes and armor in pieces." So I've been carving the outline of some dense winter trees for the group of Pilgrims to wander through. Notice in the center of this photo there's a very pronounced void in the second layer of this piece of shina plywood. This latest batch of shina from McClain's has had a lot of irregularities. I wonder if they have a new supplier. It's definitely tricky to work around a void like this.